and it's benefits for your pet! Dog massage can be a gentle rubbing given in the comfort of your home or a thorough treatment by a trained canine massage therapist. It is one of the types of massage therapy that has grown tremendously in popularity over the last few years. massage if you choose to do this at home, to ensure that your pet has no physical problems which might be worsened or aggravated by massage. Arthritis, fractures, cancer and skin conditions are examples of situations when massage may not be good for your pet. Animal massage aids the nervous system by increasing circulation, aiding digestion and helping sleep patterns. Increased blood circulation means more oxygen and nutrients can be distributed throughout your dog's body, which aids in digestion, proper movement of lymph, removal of toxins, and increased range of motion. Our pets experience trauma and injury to their bodies just like us. Even though your veterinarian has treated your pet, adhesions, scar tissue and mental stress has affected your dog. A gentle all-over rubbing can help to calm his/her nerves and conveys the massage that everything is now OK. The massage typically starts with long, petting strokes from head to toe. When the dog begins to relax, gentle pulling and scratching of ears, chin, and cheeks can be done. Using circular motions with fingers, the neck and chest are then usually massaged. Slowly, the massage then moves to the front legs, back and rear legs. 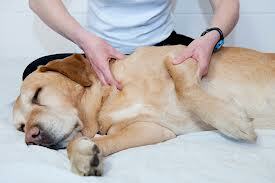 Deep massage for dogs should only be done by a trained canine massage practitioner, and even then it is rare. Deeper techniques are often performed to break up scar tissue and help to increase range of motion issues, such as hip dysplasia in older dogs, and should only be performed by a certified therapist. If you are looking for a therapist, it is often best to call the veterinarians in your area to get the name of a qualified therapist. Still, you might ask where they had their training and if they can provide references. Animal massage can range from $45-$85 per hour. Prices also depend on where you live and the experience level of the therapist. In California, New York, or Washington, prices may be up to $100 per hour. If you are searching for certification classes to perform canine massage for others, massage certification classes in massage for dogs can now be taken online or in the comfort of your home. This DVD, Therapeutic Holistic Dog Massage can help you learn how to massage your dog safely. It includes 100 illustrations and photos to teach you techniques to help your dog relax, assist them in recovery from injuries, and help ease chronic pain. Be prepared for lots of "doggie sugar" in appreciation of the wonderful relaxation you have provided. Whether you want to learn dog massage yourself or find a massage therapist who works on dogs, be aware of your dog's behavior and monitor him/her for any changes - good or bad - after massage therapy.